The No. 2 ranked Clarkston Angoras scored two goals down a man in the final 11 minutes to defeat No. 3 ranked Carrollton 2-1 at Hallford Stadium on Tuesday night to reach the Class 5A boys’ soccer state title game on Friday. A red card on Clarkston with about 30 minutes to play and trailing 1-0 put the Angoras a man down the rest of the way, but seemed to get the team fired up. The Angoras (19-1-1) continued to press on offense only to have the Carrollton goalie make some big saves to keep the score at 1-0. Clarkston goalie Bismark Dansou made a pair of big saves along the way to keep the Angoras within striking distance including one with 15:23 to play. Clarkston struck for the tying goal as a pass lofted over the Trojan defense was run down by Mohamed Tambadu pulling the goalie out of the net. Tambadu lofted a high arcing shot over the goalie into the net to knot the game at 1-1 with 10:50 to play. The two teams battled back and forth trying to get into the opponent’s end of the field without getting any real advantage until Clarkston’s Lionel Touroudu used the dribble to slip passed the Carrollton defenders. As the Carrollton goalie stepped up to cut off the near corner, Touroudu sent a shot to the far corner for the winning goal with 2:57 to play. Carrollton got the ball into Clarkston territory once, but the Angoras defense continued to push the ball back up field running the clock down. As the horn sounded the Angoras began to celebrate their second ever trip to the state finals, the last coming in 1989 (4-3 loss to Lovett). The Trojans (16-3-0) grabbed the early lead as they took advantage of the ball bouncing away from Dansou in front of the goal on a save for an open net goal with 22:51 to play in the first half. Dansou would make a diving save with 14:13 left in the first half to keep the Angoras within one score at the half. Clarkston takes on No. 1 ranked McIntosh (21-1-0) at 7:30 pm on Friday at Mercer University in Macon in an effort to bring home the school’s first soccer title. McIntosh won a regular season matchup with the Angoras 2-1 in overtime. McIntosh has wins over Thomas County Central (8-0), No. 9 Cross Keys (5-4, 3-2 penalty kicks), No. 4 Riverwood (1-0) and No. 5 Grady (4-1) in the 2017 Class 5A state playoffs. Clarkston’s road to the state finals includes wins over Cass (5-0), No. 6 Starr’s Mill 4-3, No. 8 Decatur 2-0 and No. 3 Carrollton 2-1. 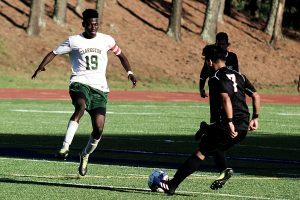 This was the Angoras sixth trip to the semifinals in boys’ soccer and marks just their second victory and trip to the state championship. Semifinal appearances for Clarkston include 1973, 1974, 1988, 1989, 1990 and 2017 was the first time in 27 years.